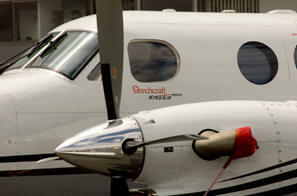 September 21, 2010 – FlightSafety International announced that it will offer Beechcraft King Air 350 training in Australia. The Full Flight Simulator is scheduled to be installed at the Ansett Aviation Training facility in Melbourne, Australia by the end of 2011. “We are pleased to support Hawker Beechcraft and our mutual Customers in Australia and the surrounding region by providing local access to King Air training programs,” said Eric Hinson, Executive Vice President, FlightSafety International. “The addition of FlightSafety’s King Air 350 training and simulator supports and strengthens our commitment and ability to provide our customers with the highest quality programs and equipment available.” said David Gilmour, Managing Director, Ansett Aviation Training. “The growing number of King Air owners and operators in the region will benefit from FlightSafety’s high quality training and Ansett Aviation’s conveniently located and well equipped facility,” said Shawn Vick, Executive Vice President, Hawker Beechcraft Corporation. The King Air 350 simulator will feature the Rockwell Collins Pro Line 21 Integrated Avionics System and will be available to King Air 200 aircraft operators for differences training. The simulator will be equipped with FlightSafety’s VITAL Visual System and electric motion and control loading technology. FlightSafety has been the authorized training provider for aircraft offered by Hawker Beechcraft Corporation for over 30 years. FlightSafety offers type specific training for pilots and maintenance technicians of Hawker Beechcraft aircraft at its Learning Centers in Atlanta, Georgia; the Greater Philadelphia/Wilmington area; Houston, Texas; Lakeland, Florida; London Farnborough in the United Kingdom; Long Beach, California; Paris-Le Bourget, France; Toledo, Ohio; Wichita, Kansas and at New York’s LaGuardia Airport. Ansett Aviation Training is located five kilometres from the Tullamarine International Airport in Melbourne, Australia. The aviation training facility is the largest in the Southern Hemisphere, currently housing twelve Full Flight Simulators with associated briefing rooms and Cabin Crew Training Simulators. The facility boasts numerous classrooms, computer based training rooms and extra amenities including an instructor’s room, communal cafeteria and lounge areas. FlightSafety International is the world’s premier professional aviation training company and supplier of flight simulators, visual systems and displays to commercial, government and military organizations. The company provides more than a million hours of training each year to pilots, technicians and other aviation professionals from 154 countries and independent territories. FlightSafety operates the world’s largest fleet of advanced full flight simulators at Learning Centers and training locations in the United States, Canada, France, Japan, South Africa and the United Kingdom.